Questions about Acupuncture? Just scroll down this page and you will find the answers to each of these questions. How Old is Acupuncture? How Long Has It Been Used? What Is Acupuncture? Is It Only About Sticking Needles In People...Or Is It More? Is Acupuncture...The Insertion of Very Fine (the thickness of a hair), Solid, Single Use-Disposable Needles Into Acupuncture Points Effective For Relieving Pain or Improving Health Conditions? If So, Who Says? How Many People In The US Have Tried Acupuncture And How Satisfied Where They? You Will Be Amazed At The Answer. Has Any Health Organization Ever Compared The Effectiveness of Acupuncture And Oriental Medicine to Western (or Allopathic) MD Drugs and Surgery? You Bet They Have! Find Out Who And What They Had To Say. What Is Qi or Chi And What Does It Do? What Does Needle Insertion Feel Like? And What Can I Expect During A Treatment? What Is An Initial Examination And Medical History Visit Like? What Am I Likely To Experience After A Treatment? What Is The Training And Experience of A Qualified Acupuncturist? Is Everyone Who Performs Acupuncture Qualified To Do So? How Long Has It Been Used For Healing? The first written record of Acupuncture (which I will sometimes call acu-point therapy) is found in the 4,700 year old Huang Di Nei Jing (Yellow Emperor’s Classic of Internal Medicine), by Shen Nung, who is known as the father of Chinese Medicine. This is said to be the oldest medical textbook in the world. Shen Nung documented theories about circulation, pulse, and the heart over 4,000 years before European medicine had any concept about them. There are written texts that date back to 300-500BC which are still studied in schools today and ancient herbal formulas that have been adapted for treatment of modern diseases. 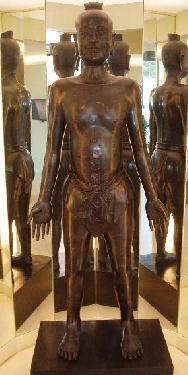 An ancient bronze statue of a man with acu-points points located on his body has been found...below are photos this ancient statue covered with acu-points along with another photo of statues of a man and woman with acu-point channels and meridians. It Is Actually Much Much More! As They Say, "A Picture Is Worth A Thousand Words"
This Is What It Looks Like When I Insert A Needle. I actually use needles that are smaller diameter than these now...there are two parts of the needle...the wire handle and the actual needle below the handle. And Here Is A Photo Of Another Patient With Needles In Her Back With Her Face Toward The Camera So You Can See That Not Only Isn't She Crying Because of Being Stuck With An Acupuncture Needle...She Is Actually Smiling Because She Feels Better Already! Actually Acu-point Therapy Is Much More Than Sticking Needles In People... Much, Much More! It is actually a powerful medical diagnostic and healing system based upon profound understanding of the body's energy systems at a deeper level and more subtle level than what we call Western or Allopathic medicine knows. Acu-point meridian therapy and its various healing processes and procedures promotes healing, strengthens the immune system, prevents disease, controls pain, and increases both functional ability and the quality of peoples lives. The key to Dr. Eichenauer's success in healing all kinds of health problems is his particular and unique expertise in using acu-meridian therapy to mobilize your body's innate healing energy. Oriental Medicine which includes meridian acu-point needling is a well-developed primary and preventative health-care system based on natural energetic laws. Dating back over 3,000 years in written documentation in Chinese history, its use is widespread in Asia, Africa, S. America, Canada, Europe and in the U.S. 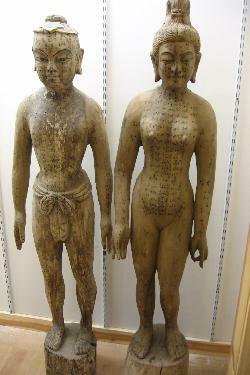 Bronze statues like the photo of the plastic "Acu-point meridian or channel dummy" below have been found in excavations in China and elsewhere dating back thousands of years ago. No one knows for sure how these ancient people determined where these channels or meridians of non-physical energy were located in the body, but only the most modern radioactive isotope tracking equipment has documented the presence of these non-electrical, non-nerve related...channels of energy. While one of the effects of competent acu-point needling treatment is symptom relief, it is much more than this. Properly performed by one with sufficient education and training...at least 4 year of formal education and training...can initiate healing of the root cause of many physical problems, but it does even more. It has served over the centuries as intervention to return a person to the dynamic balance of health. Those who receive this treatment often not only heal physically, and experience pain relief, also experience profound states of relaxation, peace, clarity and harmony through treatment which often has lasting impact. Is Acupuncture Effective At Eliminating Pain And Healing Other Health Conditions? The National Institutes of Health issued a formal statement proclaiming the effectiveness of Acu-point Meridian needling citing its safety and promise in treating many conditions for which Western medicine has little to offer. The 1997 NIH Consensus Statement concludes that results have emerged showing the efficacy of acu-point needling in adult postoperative and chemotherapy nausea and vomiting and in postoperative dental pain. There are other situations such as addiction, stroke rehabilitation, headache, menstrual cramps, tennis elbow, fibromyalgia, myo-fascial pain, osteoarthritis, low back pain, carpal tunnel syndrome, and asthma, in which acu-point is useful as an adjunct treatment or an acceptable alternative to drugs and surgery. Dr. Brian Berman, director of the Center for Integrative Medicine at the University of Maryland School of Medicine, has done a series of studies showing acu-point needling's benefits for osteoarthritis of the knee. In 1999, eight academic medical centers, including Harvard, Duke and Stanford, banded together with the purpose of encouraging research and education on alternative medicine. Eight years later, this group expanded to include a total of 38 member universities, and has gathered evidence about what practices have solid science behind them. Hands, down, this was the No. 1 recommendation from the panel of experts. They also recommended it for other problems, including nausea after surgery and chemotherapy. And How Satisfied With The Experience Where They? 1 in 10 US Adults has tried acu-point meridian therapy. This means that more than 20 million American Adults have tried it. 24% were very satisfied and 34% were satisfied. Only 8% of those who tried it said they were not at all satisfied. Acu-point needling has helped 82% of the people who have tried it. The National Health Interview Survey (NHIS) statistics on acupuncture use in the United States show that the number of visits (for acupuncture) rose from 27.2 to 79.2 per 1,000 adults between 1997 and 2007. Approximately 3.1 million adults in the United States used acu-point meridian needling within the year prior to 2007 a 47 percent increase from the 2002 NHIS estimate. The increases are related to growing evidence for acu-point needling in the treatment of medical ailments include chemo-therapy induces nausea, chronic back pain, hypertension and allergic rhinitis to name but a few things it is known and proven to be effective for. People don't choose to do something over and over again for thousands of years that doesn't work. Acupuncture And Oriental Medicine Was Just Recommended in 2012 by The World Health Organization To Be Promoted And Taught As The Best And Safest Preventative And Treatment Medicine Over Our Conventional MD...Drugs and Surgery Medicine! Here is the reasoning of the World Health Organization. Oriental Medicine Doctors are like Home Inspectors inspecting your plumbing, wiring, etc...recommending and providing remedial actions to prevent a disaster from ever occurring in your home so that you can continue to live the good life uninterrupted. Western Medicine Practitioners make their best contribution functioning in much the way firemen do who arrive on the scene after the fire has already begun and is out of control. Western Medicine is great for Emergency Room Treatment, Disaster Mitigation and Acute Health Crisis where death may be close. They continue by explaining that Western or Allopathic Medicine is too dangerous (its Pharmaceutical/ Chemical Medications are too toxic and riddled with dangerous side-effects) to use for prevention, and health restoration that is non-disaster related. Ask yourself this question, "Does it make any sense at all to take the most dangerous actions first when your life isn't being threatened"? It make more sense to me and apparently to the World Health Organization to take safe, gentle and effective remedial measures first before throwing everything including the kitchen sink at the problem. In short as an Oriental Medicine Doctor, I'm like the house inspector, I make sure the lessor things don't become worse, so that you don't end up in the emergency room unless you are in an accident." You might also wonder if there is any medicine on the needles? No, there is no medicine on the needles. They are just surgical quality stainless steel very fine or thin, sterilized, single use disposable needles. The medicine is in your own body. Your body makes it's own medicine. And acupuncture stimulates it to make more. My expert acupuncture skills involve determining which acupuncture points to stimulate your body's own healing resources to heal the root of the problem. And then expertly and painlessly inserting the needles to boost your body's healing resources and send it where it is most needed. You may not have thought about it, but you know your body is self-healing. Think about it, you cut your finger and your body snaps into action with a surprisingly complex set of responses to begin to stop the flow of blood, heal the wound and kill anything that might cause an infection. And you know that some times you have to help it a bit...maybe putting pressure on the cut or putting a bandaid on it. Or even some neosporin to prevent infection. Or if it is a more serious cut my need to get stitches to stop the bleeding. But indisputably your body heals itself. Likewise with most pain conditions your body is self-healing. For example. If you have ever sprained your ankle or broken a bone, you know that with time and protecting the affected area from further trauma while in its weakend state, the sprain heals, or the bone mends and you are out and about again with only the memory of the incident. You may need a Dr. to put the bone back together and put it in a cast, but those things don't do the healing, your body does. If you have anything that is out of wack or painful your body is trying it's best to heal that problem. You know that “straw that broke the camel's back”. Metaphorically acupuncture is like removing that straw so that the camel's back can heal. Or put another way give that camel's back the energy that it needs to heal and bear that load. Recent brain studies have demonstrated, for example, that if a specific acupuncture point has historically been used to improve the function of the eyes, when a needle is inserted into that point the visual cortex of the brain is activated. Science has proven that acupuncture works as those who discovered it and codified that knowledge said it did thousands of years ago. It is well documented that among a host of factors, acu-point needling affects endorphins, blood sugar, cholesterol, triglyceride levels, the function of the gastrointestinal system as well as every other organ system of the body and the activity of the endocrine system. Acupuncture is not a placebo if you know what that is. A placebo works because someone believes or thinks it will. Acupuncture works as well on animals as it does on we humans and guess what... animals don't believe anything, don't think anything like the way we do. Qi is Consciousness energy, your consciousness energy. ...it is that healing and restorative energy! You likely will not find this description anywhere else, but it's the truth. What Does Acu-Poing Needling Feel Like? And What Can I Expect During A Treatment? As mentioned above very fine sterilized, single use, disposable needles are gently inserted at the specific acu-point locations mentioned above. The way I insert needles is nearly always painless and is often followed with a sensation of tingling, distention, radiating gently electric like sensations or traveling warmth. Most people are surprised at the depth of relaxation, the movement of energy they feel in their body and the sense of well-being that occurs from the re-balancing of energy. More people than not fall asleep on the table, while the needles are in doing their work, because they are so deeply relaxed. Many have told me that it is more relaxing than even massage. For those who would prefer alternative stimulation of the points, I can use micro-current, light or pressure. And Medical History Consist Of? I use a highly developed and sophisticated system of observation, questioning and examination to diagnosis, treat and after treatment evaluate the success of treatment. On your first office visit I will do a thorough evaluation of your current health status and determine a wealth of information about how your body is functioning. I will look at your face, observe the way you walk and move, listen to the sound of your voice, perhaps look at the appearance of your tongue and consider many other factors to determine what is and is not functioning optimally in your body. Particular patterns of symptoms and other physical indications lead directly to treatment principles that determine the choice of the specific acu-points to use and herbs to prescribe, if indicated. After a first treatment you may experience some or a great deal of relief from symptoms immediately or in the hours after treatment. Infrequently, symptoms may temporarily worsen in 24 hrs. after a treatment and then improve. I have found that most people respond and feel better during or immediately after their treatment. Some, less than 10% are what I call next day responders. And nearly everyone responds at least a little bit. For a health issue that has been ongoing for months or years, it may take more than one treatment before you begin to feel symptom relief depending upon the severity of the symptoms. It is important to get treatment close enough together that you don't get improvement and then have it fade away. The effects of acupuncture are cumulative... with one treatment building on and providing more healing than the previous one until the problem I am treating you for goes away. Once you experience any improvement in your symptoms...that is a sign that the pattern of dysfunction is beginning to break up and that acu-point needling is working and will work to heal your condition or eliminate your pain. It is likely that the longer you have had the problem the more treatments you will need...the range is usually 2 for a recent dysfunction and normally 10 plus or minus 2 or 3 for most long term problems, but in a few cases up to 20 acupuncture treatments. Here is the thing though...you will know right from the start that you are getting better and better. It won't be like many chiropractors tell their patients, "oh you will have to come back many times over the years and may need 10 or 20 treatments before you notice any improvement at all". Most people come to look forward to treatment for the many benefits they receive...securing healing in many cases where other treatments have failed. Many who have lived with their condition for months or years believe they will just have to live with it...just make do. Others live with pain thinking that they will have to take dangerous drugs to kill the pain for the rest of their life. But none of these notions of just living with it or have to take pain medication for the rest of your life are true if you let me treat your conditions. What Is The Education and Training of A Qualified Practitioner of Acupuncture and Oriental Medicine? Only a L'AP, Acupuncturist or Doctor of Oriental Medicine who has earned a four year post-graduate degree has the extensive and required education, training including four years of clinical experience prior to practicing acupuncture on the public. Those with lesser credentials are do not understand acupuncture, and do not have the refined diagnosis and treatment skills to be qualified to perform acupuncture professionally. A doctor of Oriental Medicine has more than 2700 hours of class study, twice that number of hours of outside study and four years of hands on clinical experience treating over 300 different patients with all kinds of serious health conditions. MDs, Physical Therapists, Chiropractors and Dentists. This means that they may have inserted a needle into themselves and were given a little manual on the insertion of needles into points based upon cook-book prescriptions. Only because of the power of their lobbyists are these poorly trained and totally unqualified people allowed to perform acu-point needling on unsuspecting victims. Remember that statistic saying "Acupuncture has helped 82% of the people who have tried it. Well, treatment from practitioners with inadequate education and training largely explains the 18% of people who were not helped. Some MDs claim to be practicing "medical acupuncture", apparently to make it sound like they are practicing "the real acupuncture". Nothing could be more absurd, since they lack anything remotely sufficient in education and clinical training in it and Oriental Medicine physiology and energetic function, diagnosis, and treatment principles and skills. Often they do not know how to locate the acu-points or how to needle effectively. And since they have no training in Oriental Medicine physiology which involves learning about Qi and the channels the Qi Flows along, they lack the knowledge and ability to diagnose and develop the correct treatment principles and point selection. What this means is that if you have ever had acu-point therapy that didn't work, you probably got it from someone with inadequate training. You want someone who has the best training to treat you, don't you? You want someone whose treatments work, don't you? Call Dr. Eichenauer to schedule your appointment or for a free telephone consultation at (941) 926-4711. I Serve the Communities of Bradenton, Sarasota, Osprey, Nokomis, Venice, and North Port, Florida With Acupuncture, Oriental Medicine and Holistic Medicine Healing Services. I don't care if you are rich or poor, Black or White, Latino, Asian, Gay or Straight, Republican, Democrat or Independent; You are welcome in my clinic! By The Holistic Medicine Detective, Then You Have Come To The Right Place For Your Next Clue And Destination! 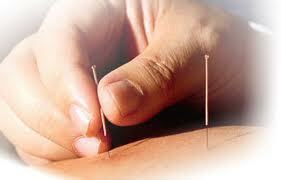 Click here to go to return to the top of this page about Acupuncture. Click here to go to my Home Page Holistic Medicine Works!